"These results will place BJP as the frontrunner in the May, 2014 general elections. The Congress on the other hand, will be disappointed with the results," said a Bank of America Merrill Lynch report. The state assembly election results are likely to place Bharatiya Janata Party (BJP) as the front runner in the May 2014 general elections, but it may not be enough to justify a further increase in the BJP tally, a Bank of America Merrill Lynch report says. According to the global brokerage major, these state assembly elections are important in boosting morale of the party and attracting allies. However, the connection between the performance in these state assembly elections and the performance in the general elections at the national level is "weak". "We think it (state assembly elections) will reinforce the current opinion polls that show BJP as the leading party. 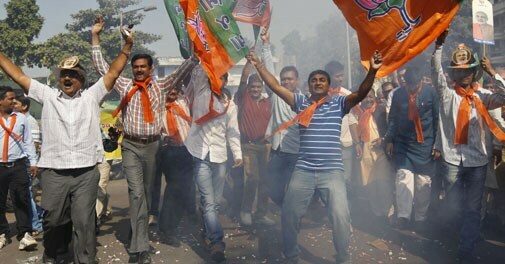 But it may not be enough to justify a further increase in the BJP tally," BofA-ML said in a research note. The report further said: "These results will place BJP as the frontrunner in the May, 2014 general elections. The Congress on the other hand, will be disappointed with the results," it added. BofA-ML , however, gave reasons to temper the enthusiasm. "Firstly, these four states account for just 13 per cent of the total Lok Sabha seats (72 of the 543 seats). Secondly, doing well in these states is not enough to indicate the direction of the 2014 election; it only indicates a direction where these 13 per cent of seats could go...," it said. Thirdly, the success of the recently formed Aam Aadmi party (AAP) in Delhi has reinforced the split nature of Indian politics where the non-Congress, non-BJP regional parties are getting powerful, BofA-ML said. "This is a reminder that we will still see a coalition Government in 2014 where regional parties will be crucial," it added. Meanwhile, stock markets are likely to do well ahead of elections. "In five of the last six elections, investors buying six months before elections and selling on the day before results would have seen positive returns. The average return has been 15 per cent," the report said.